Having got my act in order and picked up some momentum last time I’ve started to wonder how my fitness now compares with last year. Truth be told my running is still lacking much impetus, but the rest goes well. Another truth is this is a data analysis post, so expect charts to follow. I will write something about life in Busselton soon, but if that’s what you want, check Steven’s blog. Steven and Jo arrived in town earlier in the week. Despite our travels we often end up in the same places outside the UK. I’ll also take the opportunity to promote my new blog on Triathlete Europe! Quite excited to be writing for their website, will hopefully get something in most weeks and can promise no number crunching there. As a race builds up subtle insecurities sneak into the back of your mind. Have I done enough? Have I done too much? Am I too tired? Why am I so unfit? Am I light enough? The list could go on, but I’ll spare you. When this happens I start to look for reassuring signs. Whether this takes the form of a great training session or more likely fiddling with all my training data till I find something good. In my opinion I’ve had some good sessions the past week or two. Despite that I spent a Saturday afternoon watching Neighbours and working in WKO+ and Excel! The inspiration came during today’s group ride. As I desperately tried to hang on the bunch whilst the guy on the front ramped up the pace. 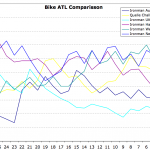 I know the past few weeks I’ve been working harder on the bike, but I wondered how it compared with last year’s race build up. What was key was the fact that I had good data for the final weeks of build before the race in 2008 and of course this year too. A couple of things to note in this comparison though. I’m comparing from five weeks to two weeks before the race. Obviously I don’t have data for the next two weeks and last year I’ve no power data for the final two weeks. Both of which are good reasons not to compare them! You can consider the following two weeks to be roughly a taper. Which comes to the second point last year I tapered for three weeks, this year I’ll be tapering for roughly ten days. So the final week of the three week block I’m comparing had different purposes. It might skew the data a little. As a positive the fact this year’s taper is shorter should be read as a sign I’m fitter! Some very broad figures to look at. With the unorthodox build period for this race I thought I’d consider how my fitness compares. So the first things to compare is the CTL (fitness), ATL (fatigue) and TSB (form). Here’s the usual reminder to read this WKO+ guide for those unfamiliar with the terms. I’m actually surprised to find that the CTL values are that close at the end of the week three. The difference being in 2008 I was dropping rapidly to that value from a first week of taper whilst this year I’m still building up. Based on that the result should be that this year I will be fitter come race day. The main concern will be ensuring my form is good and there’s not too much fatigue either. A big taper in 2008 left me very rested and the race went very well. Had I good data for the taper I suspect the CTL/ATL/TSB values wouldn’t correspond with what I’d associate with good racing. I wonder if with what I know now I could have been better prepared on race day last year? I’ll never know of course. For this year’s final weeks I’m taking the model that worked for Kona and reapplying it. This should get the fitness a little bit higher and then allow me to reduce the fatigue and build more form. We shall see of course. I’ll be looking at the taper later in the week when I’ll be doing some proper planning. Keeping it simple I’m comparing the overall training stress for the three week blocks. Both the overall and the values split for bike and run. 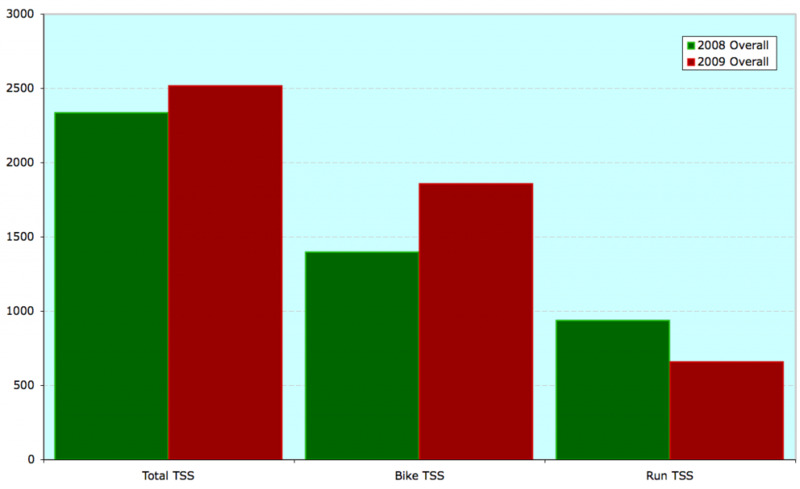 I think it’s pretty obvious the overall stress has been slightly higher this year, mostly coming from the bike. Whilst I’ve complained this race prep hasn’t gone well it clearly involved a bit more work. What’s also clear is I’m not getting back on track with my running yet. I can only hold my hands up and admit to that! One of the things that has changed from a year of training is I’m able to sustain higher training stresses than last year. I’m pretty sure I was pushing myself hard just before my taper last year. I know I’m pushing hard again this year, though not quite with the intensity I had for Kona. To be honest all this chart really achieves is reassuring me that I’m not slacking off too much. I may think I’m not doing enough, but the reality is I’m working well. Okay, except perhaps with the running. I have had some good run sessions though so I’ll draw my positive from that. I hope you’re impressed by the 3D graph! I also hope it doesn’t make the data unreadable! 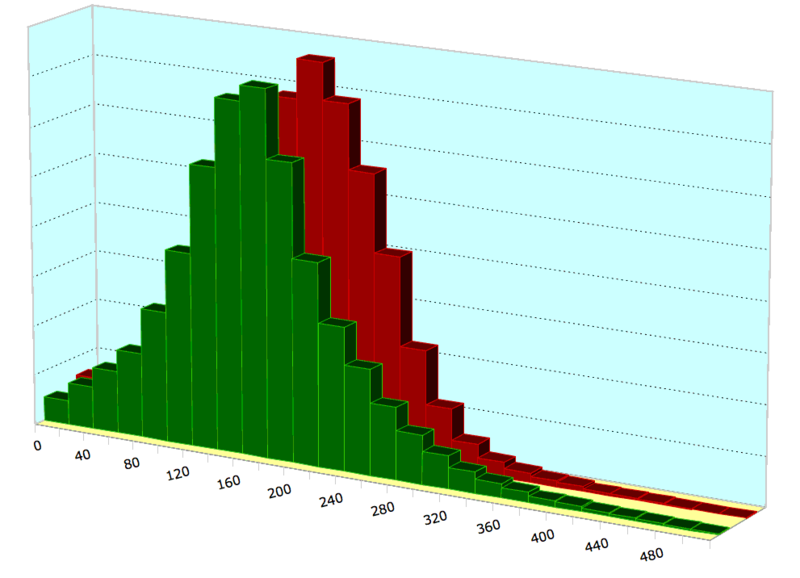 As with the previous chart green is 2008 and red 2009. Again I’m considering the three weeks together. Looking at the amount of time spent at different wattages. This is actually the comparison I first thought to look at. I wanted more reassurance that I was riding harder this year than last. All that despite a few weeks lazing about after Kona and a relatively short time coming back into fitness. I’m pleased that it achieved my aim! You can clearly see that this year I’m riding more at higher power levels. Perhaps a product of the way I’m focussing my training now compared to last year. Also though I suspect an indication that my ability as a rider has changed. It’s interesting that whilst fitness according to WKO+ is lower than it was at this point last year my riding is better. Of course the reasoning behind this can come from the fact that training stress is relative to my threshold. As I become a stronger cyclist I have to work harder to stress myself the same amount. So that’s my simplistic little comparison to reassure me that things are coming together. I’m increasingly optimistic that I can come to race day in good shape. I think my bike is stronger this year and so is my run. If I worry about anything it’s the swim!